March 2013 - Seven Countries Study | The first study to relate diet with cardiovascular disease. A high White Blood Cell (WBC) count is associated with a high all-cause mortality in the Zutphen Elderly Study. 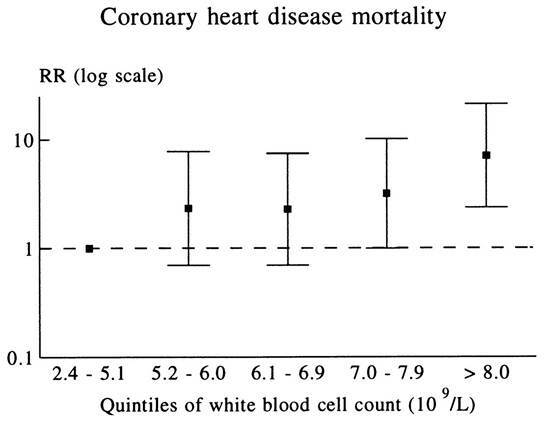 After adjustment for risk factors each 10/9/L increase in WBC was associated with a 21% higher 5-year CHD mortality. Smoking increases WBC, but this association is independent of smoking. Hand-grip strength at baseline was inversely related to 4-year disability in rural elderly men in Italy. Of the men with a hand grip strength rated “good”, 26% became disabled versus 48% who were graded “poor”. This inverse relationship of grip strength to risk of disability remained after multivariable analysis. This small study among one SCS cohort shows that hand-grip strength in older men, a simple measure of muscular strength, provides information about risk of future disability. Though hand-grip strength is influenced by several disorders, multivariable analysis showed that its prognostic value is independent of joint disorders, diabetes and cognitive function. In the Zutphen Elderly Study a high level of antibodies to C. pneumonia was associated with an almost 3-fold higher risk of first CHD events after 5 years of follow-up. This association was independent of potential confounders. In contrast, antibodies of cytomegalovirus and Helicobactor pylori were not associated with excess CHD risk. Chronic infections with C. pneumonia induce high levels of antibodies in the elderly. Antibodies to oxidized LDL are implicated in the genesis of atherosclerosis. Chronic chlamydial infection may increase the production of antibodies to oxidized LDL and enhance this process. A portion of excess risk for CHD may be an effect of C. pneumonia infection on the genesis of atherosclerosis. A long QT interval in the resting ECG was associated with a 4-fold 15-year CHD mortality risk in middle-aged men and a 3-fold 5-year risk in the elderly men of Zutphen. These associations could not be attributed to prevalent heart disease and were independent of other cardiovascular risk factors. Middle-aged men in the general population having long QT syndrome were at greater risk of fatal CHD. Though few men in Zutphen had a clearly abnormal QT interval, risk increased gradually within the range of usual or normal values in the population. [/glossary_exclude]A high White Blood Cell (WBC) count is associated with a higher CHD mortality in the Zutphen Elderly Study. After adjustment for risk factors each 109/L increase in WBC was associated with a 27% greater 5-year CHD mortality. WBC is greater in smokers, but this association was independent of smoking. WBCs are activated in the presence of atherosclerosis, which is an inflammatory process. Activated WBCs release products that induce plaque rupture and subsequent thrombus formation resulting in fatal CHD. Zutphen Elderly Study results suggest that WBC count is an important risk factor of CHD in older people. In the European cohorts of the SCS middle-aged men with a body mass index (BMI) <18.5 kg/m2 had a 2-fold greater all-cause mortality after 15 years of follow-up compared to those in the reference category (BMI 18.5-25 kg/m2). Overweight (BMI 25-30 kg/m2) was not related to a higher mortality. Obese (BMI >30 kg/m2) men who never smoked had an approximately 50% higher risk of all-cause mortality. BMI was not associated with excess all-cause mortality however in obese men who smoked. The excess all-cause mortality among the lowest BMI may be the result of a low lean body mass rather than a low fat mass. The reason for a lack of association of excess mortality with a BMI greater than 30 kg/m2 among smokers may be due to their high absolute risk of all-cause mortality. Smoking is such a dominantly determining risk factor that obesity adds only a small additional absolute risk. 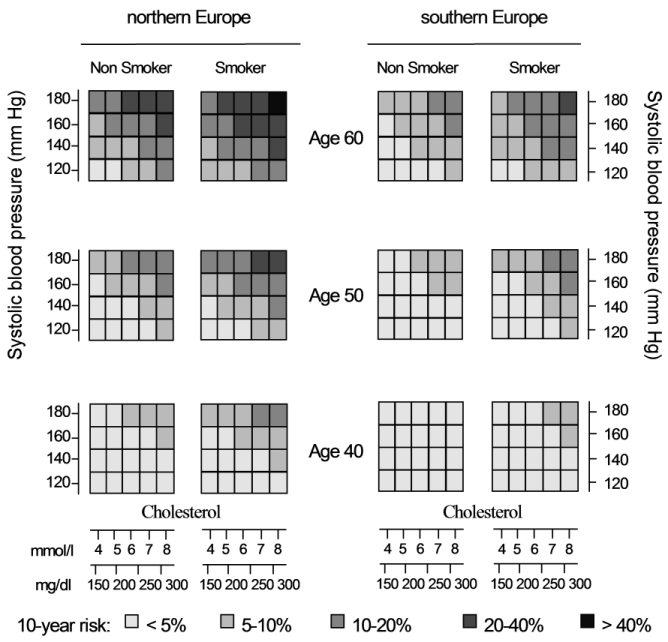 A Mediterranean style diet, a high level of physical activity, non-smoking and moderate alcohol consumption were all associated with a low 10-year risk of all-cause mortality in the European HALE project. A very low all-cause mortality risk was observed in elderly men who had four healthful diet and lifestyle factors compared to one or none. The more healthful dietary and lifestyle factors the elderly had the lower the all-cause mortality. Sixty percent of the all-cause mortality was associated with lack of adherence to this low-risk pattern. This supports the hypothesis that participants who follow a Mediterranean style diet and maintain a healthful lifestyle are less likely to die even at ages 70-90 years. In the 1960s and 70s, the Seven Countries Study and many other studies identified serum cholesterol, systolic blood pressure and smoking as major risk factors of CHD. Since then, smoking cessation and dietary interventions were promoted for primary prevention with drug treatment recommended for strongly elevated serum cholesterol and/or blood pressure levels. The accuracy of CHD risk evaluation improved when the risk factors were considered simultaneously. The table shows that three individuals with different combinations of risk factors have the same overall risk. Formerly, most clinicians treated only individuals with very high serum cholesterol and/or blood pressure levels but not those with slightly elevated levels of all three risk factors, who, in fact, had the same risk. Because the major risk factors predict not only CHD but also overall CVD risk, treatment of high-risk individuals is nowadays based on “global” CVD risk. The treatment adage has become: “the lower the risk factor levels, the better”.